Benefit Cosmetics Real Cheeky Party Blushing Beauty Kit For Holiday 2015 | Top Beauty Blog in the Philippines covering Makeup Reviews, Swatches, Skincare and More! ULTA DEAL: Get free Benefit Beauty Bag with any $40 Benefit purchase (offer valid 9-6-15 to 9-26-15 or while supplies last). Free deluxe sample Rollerlash Mascara with any $40 Benefit purchase (offer valid 9-6-15 to 9-26-15 or while supplies last) (online only). 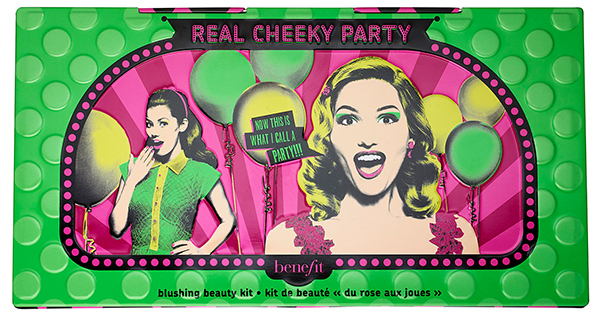 Create the ultimate glowing makeup look with Benefit’s Real Cheeky Party Blushing Beauty Kit. Sweep onto the apples of your cheeks for a pop of color. For a natural-looking tan, sweep the Hoola Matte Bronzer across the chin, cheeks, and forehead. Glide on the Watt’s Up! Highlighter onto the cheeks and brow bones, and then sculpt with its soft glow blender to create the perfect gleam. Give lashes maximum volume, length, and lift with they’re real! mascara. Create an alluring eye with the they’re real! push-up eyeliner — just twist up and glide the formula along lash line to achieve the perfect daytime or evening looks. This kit seems amazing and the packaging is so cute. I haven't seen this set before but I need it! I can't resist their packaging haha! They're a really good shades but it's too expensive. Cute containers. Really like the colors. Beautiful colors! I love blushes!